10.10.2016: Thailand Super Series TSS Round 3, Bira Circuit Super 2000 Saturday (Race 5 of the year). TSS Round 3, Bira Circuit Super 2000 Saturday (Race 5 of the year). Pole position eventually went to Chayut Yangpichit in the TT Motorsport Honda DC 5 as he was elevated post-qualifying from his berth on the other side of the front row after Pattarapol Vongprai, who had set the fastest time during qualifying, was moved down to fourth place due to a flag infringement. Munkong Sathienthirakul switched up to the front row with the row behind comprising of championship leader Kittipol Pramoj Na Ayudhya and the demoted Pattarapol. Next up were Kittipol’s teammate Thanavud Bhirombhakdi and the factory Toyota 86 of Manat Kulapalanont. At the green lights Munkong enjoyed the best start to drag his way to the front and lead the pack into Turn 2 with Chayut and Kittipol tucking in close behind. Ekprawat Petcharak also had a good start and he muscled his way past Manat’s Toyota on the run downhill from Turn 3 to the 100R corner. Through the S2 chicane Phatwit Phayakcso and Thamrong Mahadumrongkul had a brief moment where they made contact as the latter piled the pressure on the former in the battle for eighth place. However that had already become a battle for seventh place as a hundred metres ahead of them Chayut pulled off on the outside of the chicane with engine problems and would go no further. On the second lap Jetsada Yangpichit pulled off the track on the inside of the exit to the 100R turn to also retire. At the front Munkong eased out his lead to a couple of seconds over the two red, white and black Singha Motorsport Team Thailand Civic FDs initially but Pattarapol’s blistering qualifying pace was carrying over to the race and he soon dispensed with Thanavud and then closed up on Kittipol. The championship leader fended him off, but with a slightly down on power car, a transmission that wasn’t optimally geared, a full load of success ballast but more importantly a need to bring the points home for the championship, Pattarapol was always likely to find a way past. The grey Civic had a stab down the inside through 100R but suffered a bit of a wobble, corrected it but then got the job done at Turn 11 as Kittipol gave him enough room. 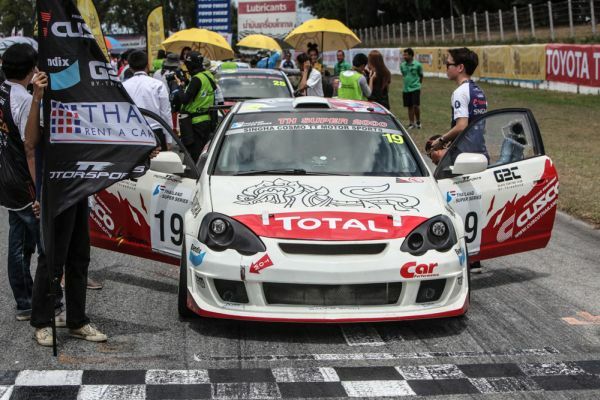 The race changing moment though would come on the sixth lap as the returning Wijak Lertprasertpakorn, who had been fending off the two factory Toyota Altis cars behind him, spinning on the entry to 100R. The red cars managed to get round on either side but with oil down on the track the yellow Toyota Altezza of David Yupensak also spun and then as the leaders came thundering down the hill seconds later. Munkong took the left route, bouncing through the gravel trap while Pattarapol jammed on the brakes and went right, Kittipol also just squeezed down the left without too much problem but Thanavud was a passenger as his Civic plunged off deep into the gravel. That brought out the Safety Car. While the pack was trundling round Thamrong pitted with an alternator problem on his Civic FD and would loose a lap before rejoining. When the race resumed Munkong’s advantage been eradicated and the flying Pattarapol now had designs on P1. He took a look down the outside on the rundown to the S2 chicane but it was a lap later that he made it stick at the same turn, he shimmied down the outside but this time jinked across to the inside, elbowed his way down the side of the bright blue race leading Civic as Munkong went in too deep and locked up with a puff of tyre smoke, Pattarapol was through and leading his first Super 2000 race on his category debut. With a quarter of the race remaining it seemed to have settled down apart from the two Altis’s squeezing past David’s Altezza in a fluid motion at Turn 11, but then the destiny of the championship title became almost a formality as Manat slowed up through Turn 3 and parked the Toyota 86 on the inside. With Kittipol in a very comfortable third place on the road (and set to collect the points for second place as the race leader wasn’t eligible to score) the gap in the title race looked set to widen to a point where mathematics almost went out of the window. At the front, after 20 laps of racing, Pattarapol etched his name in the Super 2000 record books at his first attempt, romping across the line with 2.5 seconds in hand over Munkong after a very impressive race long display. Simply a perfect way to start his touring car career; job done superbly. Kittipol closed up on Munkong over the closing laps but chose caution as he protected the 15 points that virtually assured him of the title. Ekprawat in the unique Civic FB and Phatwit in his regular Honda City secured the final steps of the overall podium. Sixth place went to the first of the factory Toyotas, the #2 of Pure Hongsapan. He finished one and a half seconds clear of his teammate Thanakorn Buttawong who also won ‘Class 2’. Then came Thamrong and David to wrap up the classified finishers.